As customary every month I send to my clients and people in my sphere of influence a tip of the month, suggestions, useful information, updates on new trends, new building codes or rules and basically anything that concerns homes, building a home, remodeling/addition ideas and practices for a good living. 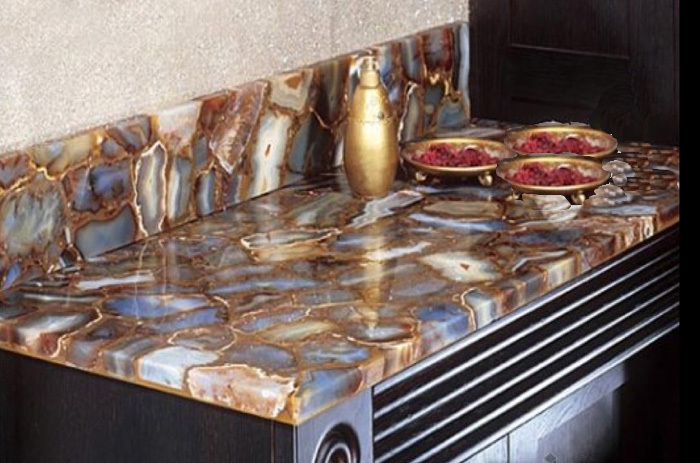 This month, I want to bring to your attention a new solution for countertops made of semi-precious stones, such as Agate, Lapis Lazuli, Tigers-Eye, Jasper, Fossil Woods, Malachite, Pyrite, Obsidian, Sugilite, Quartz just to name a few. 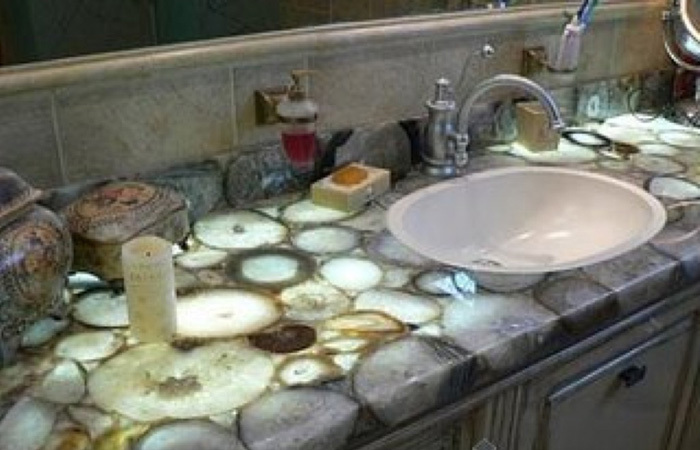 Imagine covering a small vanity counter fabricated in one of these semi-precious stones, it would be a sculptural dream! As alternative, imagine using them as an accent in some parts of the kitchen, perhaps on the backsplash. The result is an art form of its own kind and of course it adds value to any property. The application of these semi-precious stones is limitless, from bars, vanities and counter tops to wall art, frames, shelves and fireplaces; from desks and table tops to light-traffic flooring and staircases; perfect for yacht cabins. I am a Designer well-known to bring originality to people’s homes. Should anything like this strike your fancy, I would like to be the one to give you these special solutions ready and available to me. As an Italian designer and true to my origins, I provide only the best workmanship and design solutions. In business since 1990 and not counting. Valentina Cirasola is an Italian Interior Designer, working in the USA and Europe. She “is a woman who knows her stones”, says Gentry Magazine. This is really cool, and for a mineral and gem lover, or a lover of stones and rock, WOW, this might really hit the spot. Very cool. Thank you for your reply, I really love the potential of these stones, especially when they are illuminated from the bottom.